A nasal septoplasty to correct a deviated septum is a procedure commonly performed by Ear, Nose, and Throat specialists. The nasal septum is the wall between the two nasal cavities, and is composed of both cartilage and bone, lined on both sides with nasal mucus membrane. It is quite a large structure, spanning the distance from the top of the palate to the base of the skull. 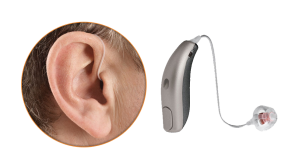 It extends several inches back in the nasal cavity. 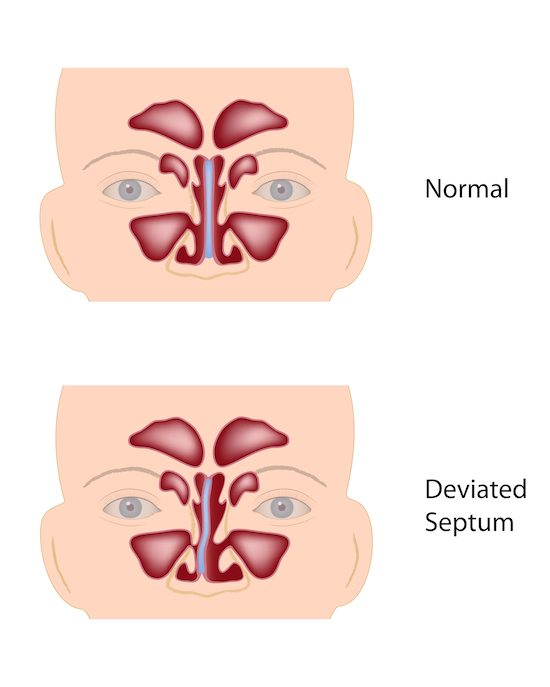 Virtually everyone has a little deviation of their nasal septum at birth, or develop it during early childhood. Occasionally a deviated septum occurs as a result of trauma to the nose. By and large, the majority of deviations of the septum are NOT due to trauma. Usually in cases of septal deviation, one nasal passage is more obstructed than the other, but occasionally both are obstructed due to deviation of the septum to both sides. Any patient who complains of long-term, or progressive lessening of nasal airflow deserves an exam by an ENT doctor, not only to investigate for a deviated septum, but to also look for other conditions which might lead to nasal obstruction, for example nasal polyps, tumors, enlarged turbinates, etc. 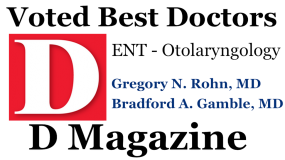 Not everyone who is noted to have a deviated septum needs to be treated with surgery. Many patients simply have conditions which cause the lining of the inside of the nose to swell, such as allergies or recurrent nasal or sinus infections. Often, treatment of these issues will satisfy the patient, making surgery for a deviated septum unnecessary. However, in patients who fail to respond to treatment for allergies (nasal steroids, antihistamines, etc), or to treatment for other conditions, surgery to correct the deviated septum is indicated to improve the patient’s nasal airflow and quality of life. Other conditions which are sometimes improved by a septoplasty are snoring, mild cases of sleep apnea, chronic mouth breathing, and some forms of facial pain. Occasionally, a CT scan will be performed preoperatively to better evaluate the septum or to look for other conditions which might be contributing to the patient’s nasal or facial symptoms. Surgical treatment for a deviated septum is referred to as a septoplasty. It is not to be confused with a rhinoplasty, which is a surgical procedure aimed at correcting the external appearance of the nose. During a septoplasty, the goal is to improve breathing, and to NOT change the appearance of the nose externally. In a rhinoplasty, the external walls of the nose are accessed via a small incision through the external nasal skin, and then can be adjusted by working under the skin of the nasal skeleton. In a septoplasty, the incision is inside the nose, and cannot be seen externally. It is usually made about ½ inch back in one nostril. Quite a bit of work can be done through this small incision, including correcting any cartilage or bony deformity that might be causing obstruction. After the correction is completed, this small incision is closed with several sutures, which dissolve over the first 1-2 weeks. The procedure is routinely performed under a general anesthesia, in the operating room. The procedure itself takes about an hour. At the conclusion of the operation, splints are placed in the nose in most cases. These are silicone sheets that sit on both sides of the septum and hold it in place during the first week. The splints are not visible externally and do not hurt. Contrary to popular belief, removal of the splints is only minimally uncomfortable. As soon as the procedure is completed, the patient is then awoken from the anesthesia, transported to the recovery room, and then discharged from the surgery facility once fully recovered. Please refer to our post-operative instructions sheet for more information on the expectations/limitations/instructions after a septoplasty. Frequently, a septoplasty is combined with endoscopic sinus surgery in patients who have recurrent or chronic sinus infections. It can be combined with removal of nasal polyps or tumors in applicable patients. It is very often combined with an inferior turbinate reduction in patients with enlarged turbinates, which can independently contribute to nasal obstruction. Finally, it can be combined with a rhinoplasty in patients who desire BOTH correction of nasal airflow issues and cosmetic deformities. A septoplasty is one of the more gratifying procedures that we perform, in that the vast majority of our patients experience a large improvement in nasal airflow. Complications of septoplasty are infrequent, but can include failure to correct the deviation completely, with need for revision, septal perforation, post-operative nasal hemorrhage, an alteration in the sense of smell, temporary numbness of the upper lip or gums over the central teeth, or a post-operative nasal or sinus infection. 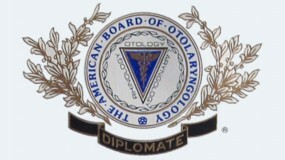 Read about post-operative instructions for septoplasty.